Saturday was an open day for me. My wife was staying with the grandkids and I wasn’t scheduled for work over the Holiday weekend. My buddy Sid has plans to attend the BYU / Utah football game so I was going to be solo. Looking over my meager collection of keeper coins for the year I suddenly noticed I didn’t have a single Merc dime to my name. Usually they are my most frequently found silver coin but for whatever reason they’ve been hard to come by this year. So I thought I should get out this Saturday and see if I could turn one up. A few hours later I arrived in front of the last old house Sid and I partially hunted a couple weeks ago. I pulled out the Eq800 and spent the next 10 min trying to re-pair the wireless headphone to the detector. Last week I had rolled the detector forward again to the v1.75 firmware and also did a factory reset. I forgot the reset wipes out the pairing info and I had to look up the instructions on the pdf manual I keep on my cell phone. There were a couple inches of snow on the ground that wasn’t there last time and there were obvious detectorists tracks in the snow with an occasional plug. Somebodies else has been detecting the old house; looking like earlier that same day. They had been wearing snow boots so I would guess they were a more serious detectorists to be out in the weather. I don’t mind hunting behind other detectorists. You can often tell what they’re looking for by targets they don’t dig and how good they are at their craft. The old house sits on a corner and I started with the side I didn’t get to on our last visit. I turned up a couple of easy shallow pennies, two of them wheaties. Next was a hard one, as a large piece of metal near the sidewalk was making it difficult to get a read on a little target nearby. Especially pinpointing. It was reading in the high 20’s but I could only get signal from a certain direction. It was a good sound though so i approximated the center of the target and dug a plug several inches and was rewarded with a silver dime. Not a merc though. Rosie. It was a good find most would miss. Not long after was another good signal out in the open reading 14-15 which is above regular old nickels. This was a silver war nickel. The previous detectorist was likely there the previous day as the plugs weren’t quite seated in all the way, something that can happen when you’re digging in semi frozen grass. The frozen ground doesn’t fit together quite perfectly so the plug sits up a bit. I seated them firmly as I passed by. I checked them all of course, as digging in frozen ground can sometimes prove very difficult. This detectorist left a few unwanted targets sitting next to the plugs; mostly empty cartridge casings for a .30-30 and a few other items. I took these with me. 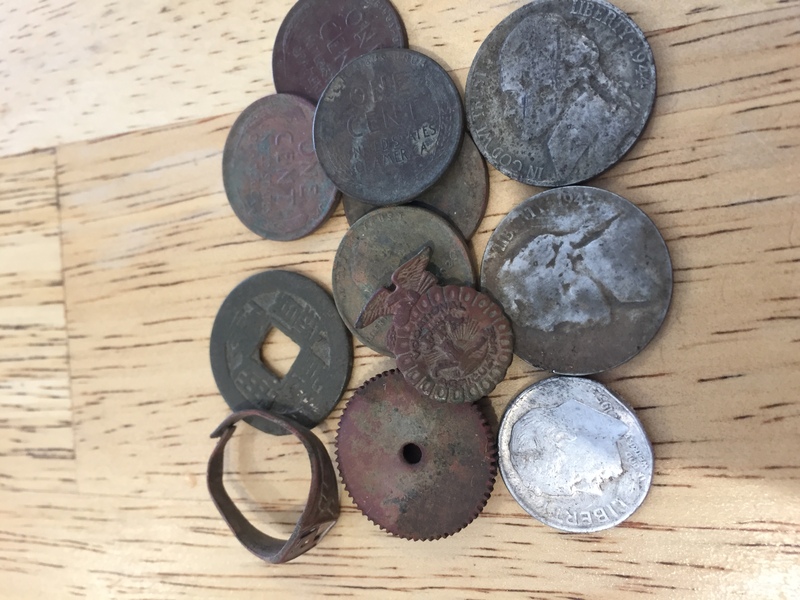 I turned up another silver nickel and a few old Jefferson’s that had been missed or skipped. 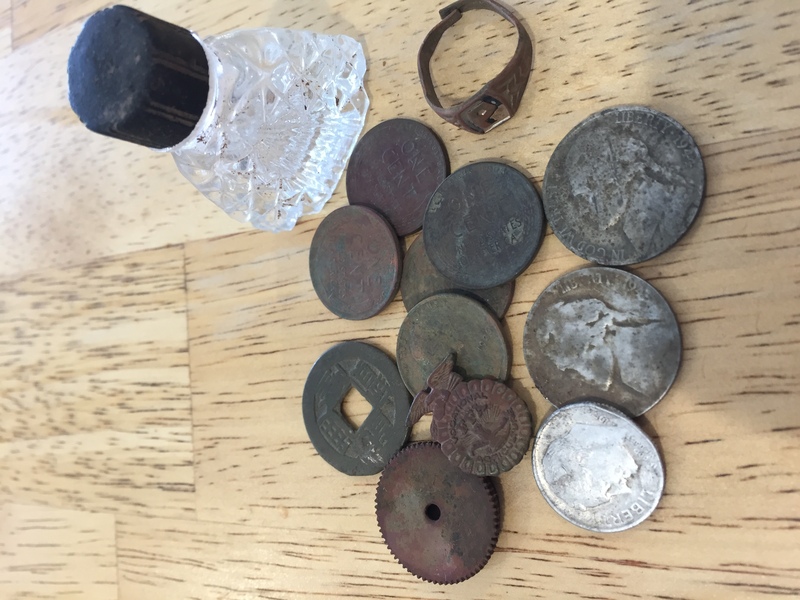 I also found a ring , wheatie, long rusty nail and small rusty nail all in the same hole. A short time later I got a pulltab signal that sounded deep but didn’t show that deep. I cut a good plug and got out the pinpointer and dug a couple inches further and pull out a rusty nail about 16d in size. That couldn’t be right. I waved the coil over the hole again. Still a signal in the same spot. I took out another 3” of dirt and saw a coin. A Chinese cash coin. Been a while since I found one of these. Another good find most detectorists would miss. Not far away was and zinc penny zone signal that had a nice deep sound to it. Ended up being an FFA (future farmers of America) pin intact. I looked over the area I had hunted previous for signs of my visitor having dug items I had missed or left behind. Total of 3 holes on that side of the yard. I had left a couple shallow zinc targets as all of the older items I was finding were deep. Still, you never know unless you dig. I was pretty wet and muddy as darkness settled. Hungry as well. I didn’t even get a chance to break out the etrac. The EQ800 had done pretty well though. A silver dime a pair of silver nickels and some other keepers. A good day in my book. Oldest coin for the day is likely the cash coin but I haven’t looked it up. Oldest US was a 1926 wheatie. Glad I was able to get out. Edited 5 time(s). Last edit at 11/25/2018 07:08PM by Rich (Utah).